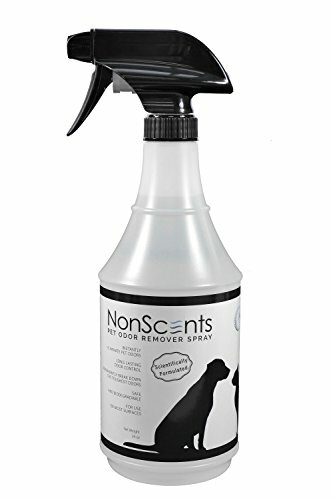 NonScents Cat Litter Deodorizer is a revolutionary odor control product that uses patented cutting-edge technology to destroy odor compounds at the molecular level. This makes it far more effective than products relying on baking soda, charcoal, or enzymes. 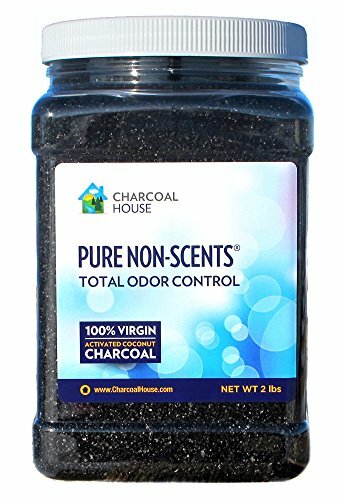 No overpowering fragrances are used to try to overpower odors - this product simply makes them go away. It works like magic, but is powered by science. 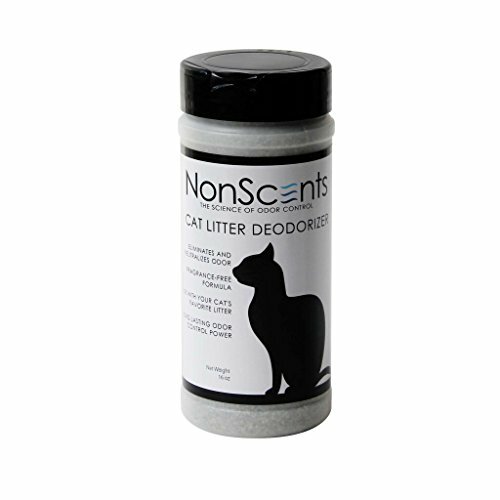 Despite its potency, NonScents litter deodorizer is completely safe for you and your pet. It's easy to use too, just sprinkle a thin layer over the litter each time you change it (or periodically as needed). Scoop solid waste regularly, and kitty litter odors will disappear! This deodorizer works best with traditional (clumping or non-clumping) kitty litter. If your cat uses non-traditional gel, newspaper, or wood litters, or a litter pad system, we recommend spraying the top of the litter with NonScents Pet Odor Spray instead. Each 16oz bottle is sufficient for a month of use in most 1-2 cat households. Bulk packaging is also available to save you money. 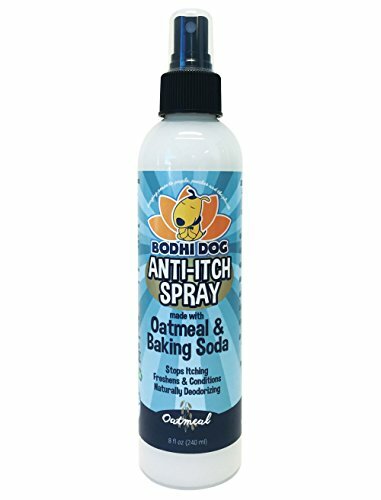 Scientifically formulated for odor control, NonScents Pet Odor Remover Spray permanently destroys odors at the molecular level, removing the root cause of any odor problem. Our products are scent-free, so there are no cloying fragrances that simply disguise bad smalls. After a few minutes of spraying, all you will smell is clean, fresh air. The spray can be used almost anywhere in your home and at work. Try it on blankets, curtains, rugs, and even directly in your garbage can and enjoy an odor-free environment! 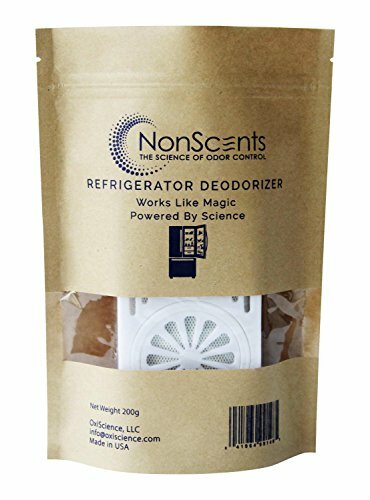 The NonScents Refrigerator Deodorizer is your fridge's new best friend. Instead of trapping or absorbing bad smells, the deodorizer uses our advanced patent-pending coated zeolite formula to permanently eliminate smelly fridge odors at the molecular level. Additionally, the deodorizer prevents mildew, mold, and spoilants from growing, extending the shelf life of your food and drinks. Unlike traditional baking soda that tends to last around a month, the deodorizer can maintain its powerful odor-eliminating powers for 6-12 months with no maintenance and re-activation required. Our formula is 100% biodegradable, fragrance-free, and food-safe. All you need to do is place our compact, spill-proof deodorizer anywhere in your fridge or freezer, and within a few hours, you will be greeted with the smell of a brand-new fridge! 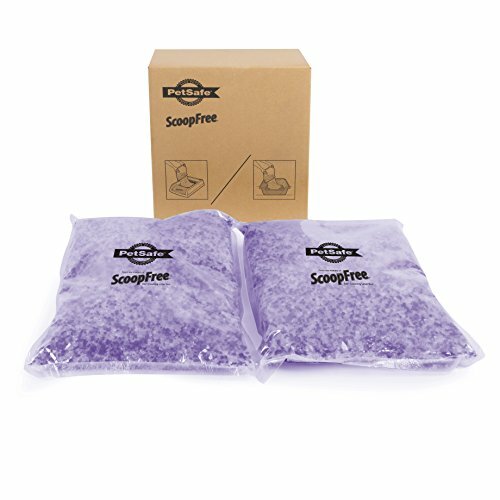 The ScoopFree Premium Lavender Crystal Litter 2-Pack comes with two pre-portioned bags of PetSafe crystal litter in a soothing lavender scent. The crystals absorb moisture on contact to quickly remove odors instead of masking them and can be used with any litter box or as refills for the ScoopFree Reusable Litter Tray. When used with the ScoopFree Self-Cleaning Litter Box and Reusable Litter Tray, one bag can last up to 30 days in a single-cat household!. Natural Non-Scents Baby Lotion Moisturizing and soothing unscented calendula NO Petroleum, Mineral Oil, Parabens, or Artificial Fragrance Natural Non-Scents Baby Lotion is truly unscented lotion that’s perfect for just-plain-sensitive or brand-new-to-the-world skin. It contains organic herbs and oils to moisturize babies of all ages — from top to bottom, and from cheek to shining cheek. Know this: we’ve formulated this lotion with extra care, because what goes on your baby goes in your baby. Dermatologist tested and clinically tested for irritation. NO petroleum, mineral oil, parabens, or artificial fragrance. The very first US personal care product certified to the NSF/ANSI 305 Standard for Personal Care Products Containing Organic Ingredients. About Earth Mama From the positive test to the big push, from the first latch to the thousandth diaper, Earth Mama makes effective organic and natural herbal products for the whole journey of motherhood: pregnancy, postpartum, breastfeeding, and baby care. We’ve been safely nurturing mamas this way since 2002 — and we wouldn't do it any other way. 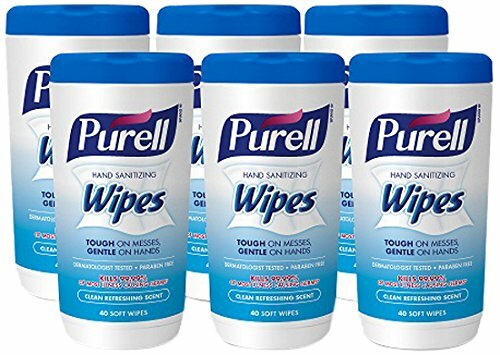 PURELL Hand Sanitizing Wipes, the gentle way to clean hands at home, in the car, and on the go. Containing no harsh chemicals, they are safe to use on hands. These wipes are soft textured and durable to easily clean up you and your family. The 40 Count Canister fits in a car cup-holder making it convenient to take with you on the go. These wipes provide safe and effective cleaning when soap and water are not available and they are dermatologist tested. PURELL Hand Sanitizing Wipes contain benzalkonium chloride (BAK), which effectively kills 99.99 percent of most common germs that may cause illness. The convenience of this small canister design allows you to have the germ kill power to clean and sanitize hands at home, at work, or on-the-go. This multi-pack includes 6 Clean Refreshing Scent canisters containing 40 wipes each. Naturally unscented, safe and gentle Natural Non-Scents Body Wash & Shampoo is perfect for extra sensitive babies of all ages. Versatile and certified contains organic calendula. 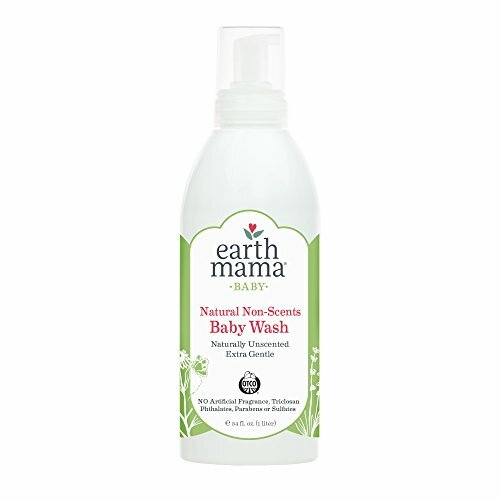 Earth Mama’s baby body wash & shampoos are so safe they are chosen by hospitals for newborns’ first baths. Detergent free, non-toxic and made without fragrance chemicals, Triclosan, parabens or harsh sulfates. Versatile for all your DIY castile soap projects. Liter size is perfect for castile soap recipes, refills and family use. Naturally unscented, safe and gentle Natural Non-Scents Body Wash & Shampoo is perfect for extra sensitive babies of all ages. Detergent-free, natural castile shampoo soap for baby bath time, hand washing and head-to-toe family clean. Made with soothing organic Calendula, Earth Mama’s safe baby shampoos are body washes too, and so safe hospitals choose them for newborns’ first baths. Detergent free, non-toxic and made without synthetic fragrance, Triclosan, phthalates, parabens and harsh sulfates. Versatile for all your DIY castile soap projects. Formulated by a Nurse and Herbalist, hospital recommended, NSF/ANSI 305 Certified by Oregon Tilth. Toxin free, rated 0 for toxins on EWG's Skin Deep Cosmetics Database. Naturally vegan. Made in the USA. Mama wants you to know: this is all natural castile soap, not a “no-tear” formula, please use with the self-foaming bottle and use extra care around your angel baby’s eyes! Legal Disclaimer: These statements have not been evaluated by the Food and Drug Administration. This product is not intended to diagnose, treat, cure or prevent any disease.